The lovely Laura has chosen our theme this week at Make My Monday - Sprays and Mists. The only spray or mist I own is a Perfect Pearls one in Gumball Pink but I think I managed to make it look Christmassy! The spray is on the background which is the Hardwood stamp, stamped on to Blushing Bride card stock with Blushing Bride ink. The pearlescent spray was then sprayed on to the background. 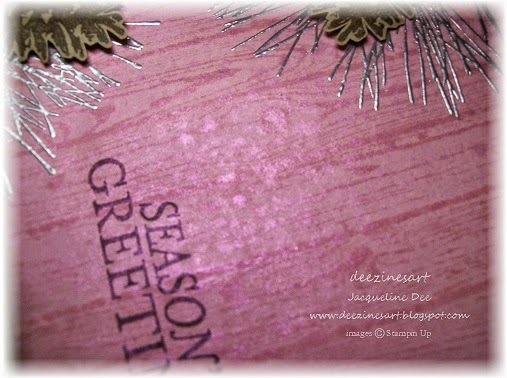 Really beautiful card Jacqueline and your pine sprigs look so lovely against the pink woodgrain. Love the pine branches on the pink shimmery background! What a lovely card!!! 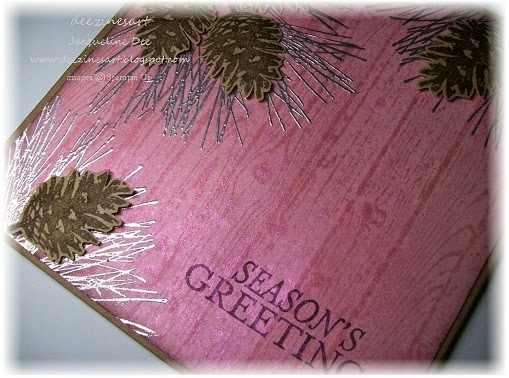 Love the pink with the silver and pinecones!!! 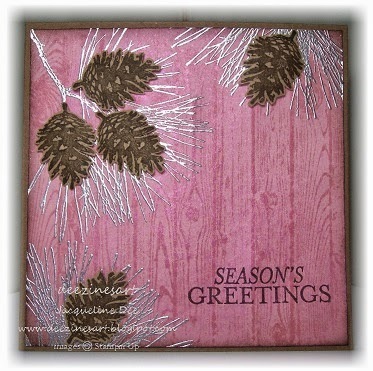 lovely card, the pinecones work so well with the hardwood background. Gorgeous colors and design Jacqueline. I would never have chosen a combo of pink with pine cones and yet it looks fantastic, especially with the silver pine needles.